MKSAP 18 Tracker — a free enhancement to MKSAP 18 Digital or Complete — combines the learner benefits of MKSAP 18’s unparalleled self-assessment content with an educator’s toolbox enabling monitoring of residents’ progress as they work through MKSAP’s 1,200 multiple-choice questions. With MKSAP 18 Tracker, educators can maximize the educational value of ACP’s comprehensive learning management system. Using MKSAP 18 Tracker can also help programs meet their documentation needs, serving as a source of documentation of resident performance and reporting on attributes of the Medical Knowledge competency. Individuals from your institution, such as educators or administrators, may serve in the “monitoring/administrative” role. A MKSAP 18 Digital or Complete Account is NOT required to participate as a monitor/administrator in MKSAP 18 Tracker. 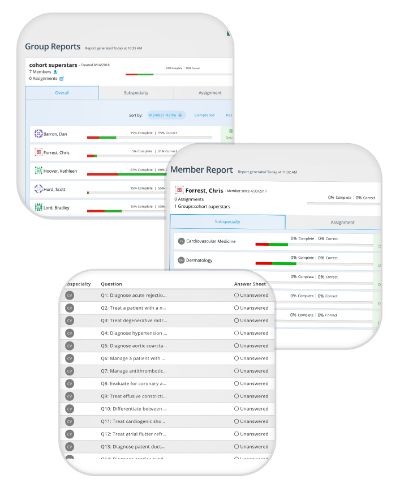 In the monitoring/administrative role, individuals can create groups, invite residents to participate, make assignments, and view and export reports. They will also be able to view question content through the tool. Individuals from your institution who might fulfill these roles include the program director, assistant program director, chief resident, other faculty, program administrator/coordinator, or whomever else you assign in an educator’s role. More than one individual can be assigned to serve in the monitoring/administrative role. 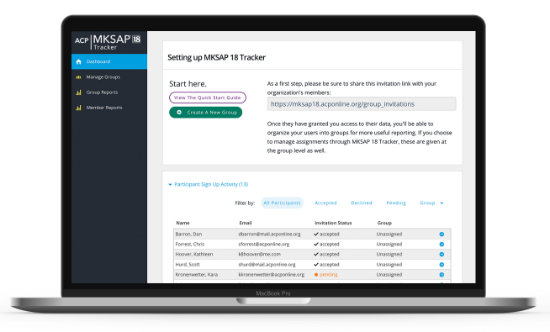 Residents who are subscribers to MKSAP 18 Digital or MKSAP 18 Complete can participate in MKSAP 18 Tracker. Residents with MKSAP 18 Print only cannot participate. Residents within institutions participating in MKSAP 18 Tracker will receive invitations from monitors/administrators after the program’s Tracker account is established. By consenting to participate, residents will give monitors/administrators permission to view their progress in completing assignments or answering MKSAP 18 questions on their own. Residents who consent to participate will receive assignment notifications from their program’s monitors/administrators on their MKSAP 18 Digital dashboard. Sharing of MKSAP 18 Digital usernames and passwords is strictly prohibited. MKSAP 18 Digital is designed for individual use as per the MKSAP 18 Digital End-User License Agreement. Residents who share their MKSAP 18 username and password with other residents nullify the validity of their scores reported through MKSAP 18 tracker because accounts that are shared no longer reflect an individual resident’s progress. We monitor access and use on accounts, and we will suspend access to the program for any account where we suspect account sharing. Sharing of MKSAP 18 Tracker usernames and passwords with those who do not specifically have an ACP MKSAP 18 Tracker account is strictly prohibited. Sharing of MKSAP 18 Tracker usernames or passwords with those who do not have accounts jeopardizes the privacy of residents, whose MKSAP 18 performance status is contained within MKSAP 18 Tracker. MKSAP 18 Digital or Complete subscribers participating in MKSAP 18 Tracker will use their ACP username and password to access the tool. All individuals serving as monitors/administrators will be given unique usernames and passwords to access MKSAP 18 Tracker and do not need to share accounts. A MKSAP 18 Digital account is not required for monitors/administrators. Multiple people from your program may serve as monitor/administrator. Complete and submit the sign-up form, indicating the names and contact information for those you have identified as monitors/administrators. Do not sign up your residents! ACP will link your residents' MKSAP 18 Digital accounts with the Tracker behind the scenes. Ensure that all of the residents who will be monitored have a MKSAP 18 Digital or Complete subscription. MKSAP 18 Print-only subscribers cannot participate. After you have signed up, ACP will send you instructions on how to access MKSAP 18 Tracker and invite your residents to participate beginning August 31, 2018 with the launch of MKSAP 18 Part A Digital. Please allow 3 business days for setting up accounts. If your institution is already using the MKSAP 17 Tracker, you can continue to use it for your residents with MKSAP 17 Digital/Complete subscriptions through January 2021; however, because MKSAP 17 Tracker and MKSAP 18 Tracker are separate applications, each associated with either MKSAP 17 or 18 Digital, respectively, you will need to sign up now to start a MKSAP 18 Tracker account for monitoring of any of your residents with MKSAP 18 Digital or Complete subscriptions. To merge your data for residents with MKSAP 17 and MKSAP 18 Digital accounts, use the Export Data feature in MKSAP 18 Tracker to export reports to Excel or .CSV files and combine data from both applications.